Every now and then, I look around my shop and decide I need to make changes usually because I am out of space or I realize there are better ways to work. 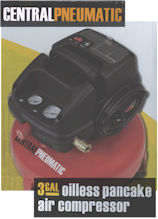 Recently I decided to downsize to a pancake style air compressor and add a retractable hose reel. This is my review of the Harbor Freight Central Pneumatic item 61615 Three gallon oilless pancake air compressor. I paid US$54.99 before tax for mine. As far as I know, Harbor Freights famous 20% off any one item coupon excludes air compressors. I have seen these on special, so if you can wait you may do better then me. It was well packaged and all I had to supply was a connecting hose to my reel (my review of reel here ). From a specifications perspective, the most important to me was that I would be able to run this in my shop without special power wiring. I measured around 3 amp when running which matches what 1/3 hp motor would typically draw. Be sure to review the use chart for your plans. SCFM means Standard Cubic Feet per Minute. This compressor is only able to put out 1.0 SCFM at 40 PSI so that is going to exclude a lot of tools. My main use for this compressor will be tire inflation and blowing out debris from filters so I am sure it will work for me. I really like that the unit has two gauges : one for what the tank psi is and the other what the pressure is on the exit line. You can then adjust the regulator to get the desired line pressure as you like to a maximum of 100 psi. The exit connector for the line is brass and it looked high quality to me. With a pistol style air inflator at the end of a 50 foot hose, I had no trouble airing up tractor or car tires. All air compressors are noisy. This one is rated at 87 dBA which means you don’t really need hearing protection if you are some distance away from it. But, if you are working close by to it, it would be a good idea to protect your hearing. If you are new to air compressors, be aware they can start up at any time if the switch is on to maintain tank pressure. I would recommend this unit if your needs are light duty like mine and especially if your shop is short on power or space.